Miracle cure for cold sores - there, I said it! What is the Human Microbiome? A special post today: My friend C made me a knitted snail as emblem for the My Bugs And I (MBAI) blog! How nice is that?? 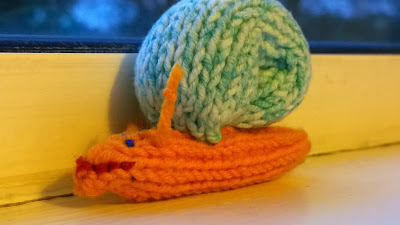 Here is Chole, the Snail! Scientists researching microbiota of animals and insects have understood a lot about their species inhabiting them, how they protect themselves, digest, and fight invaders. One organism that hasn't received a lot of attention is molluscs. Considering that a lot of research has been carried out in humans but so little is known or accepted, I think it is quite fitting that Chole should be the emblem of the blog as he represents the unknown.